Over the last 100 years or so advertising has been integrated into every walk of life. Whether you are working on the internet, relaxing at home watching TV or getting the bus or train to the cinema; you cannot avoid being bombarded with advertisements from all angles. 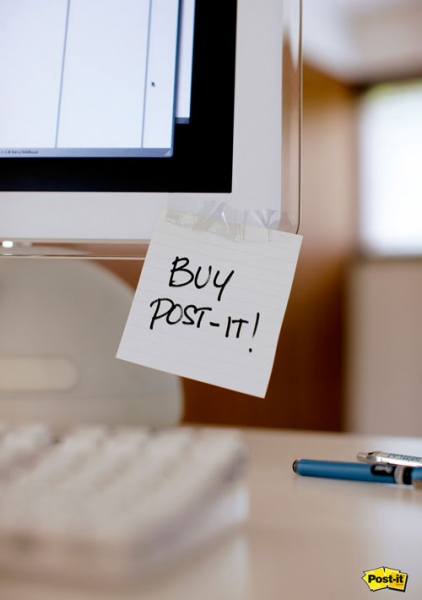 The sheer volume of advertisements that people see can make it tough for advertisers to get their message across. To penetrate this ad blindness companies have come up with lots of interesting ways to make their advertisements funny, entertaining and interactive. At the very least they want to grab your attention so that you remember their brand. Today we would like to share with you 30 creative advertisements that made people stop and take notice using inventive and entertaining ways. 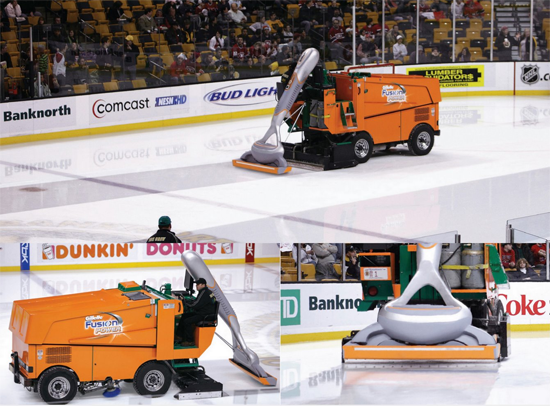 Gillette promoted the launch of their Fusion razor by converting a Zamboni into a ‘Fusion Ice Machine’. Zambonis are commonly used during breaks in Ice Hockey matches so this creative advertisement would have gotten a lot of exposure. A simple idea that creates the illusion of a showroom in the back of a delivery truck. 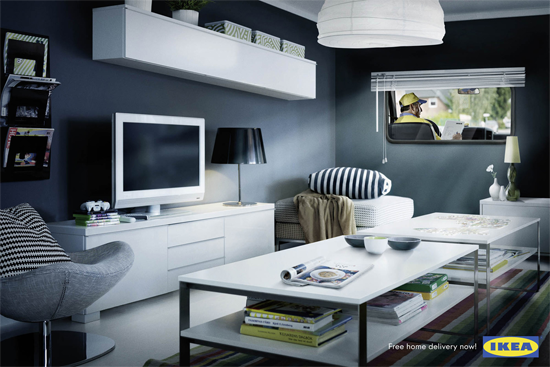 The ad was launched to promote the introduction of free home delivery by Ikea (though fans of the ad turned customer may have been disappointed when the Ikea delivery van arrived and they realised they had to build everything themselves!). “Stay down longer”. 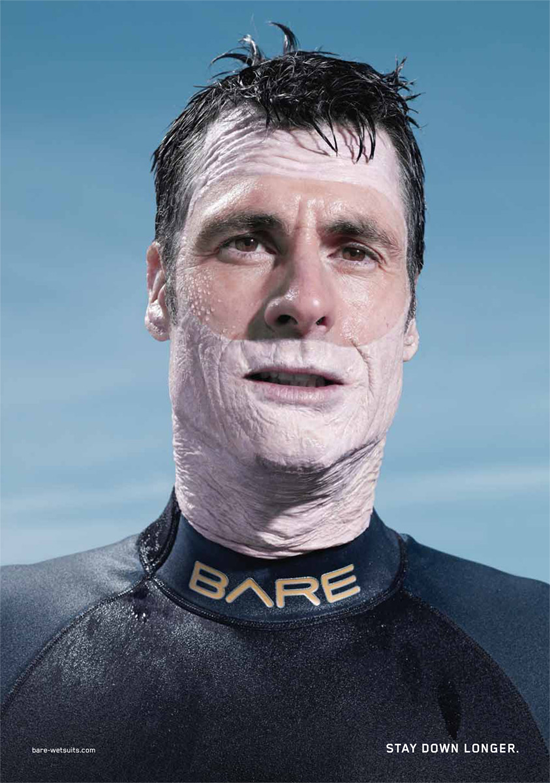 A somewhat freaky advertisement that exaggerates the seal and protective nature of their wet-suits. It’s a good idea that was implemented well. 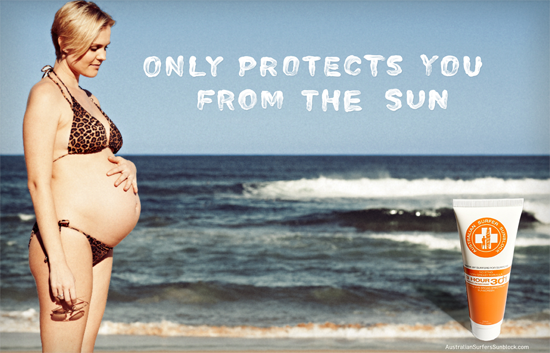 A cheeky ad from down under that emphasises that the sunblock only protects you from the sun. The pregnant woman ad is part of a fairly tongue-in-cheek campaign, with similar ads showing a drunk man who has been written on while sleeping on the beach and a truck that has been torched. 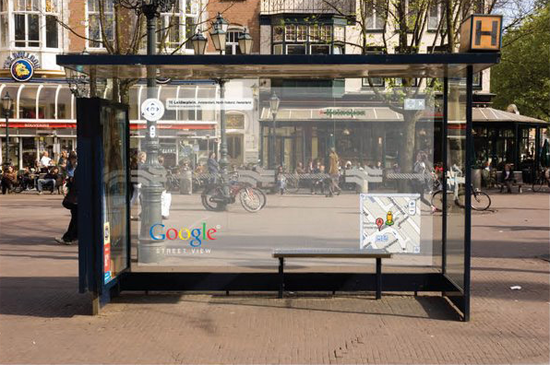 Google made use of the fact that most bus shelters in the UK are see through by giving passers by a live preview of what their Street View service would look like. They also placed directional arrows on foot paths and cycle lanes. 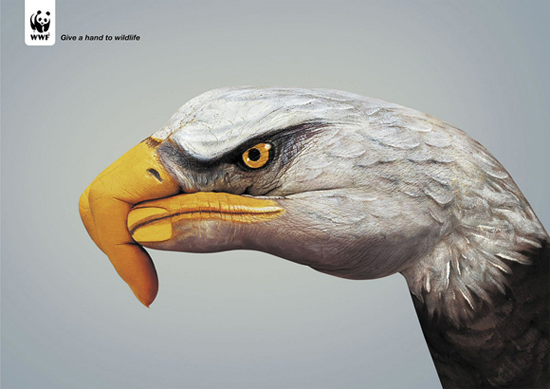 To promote their ‘Give a hand to wildlife’ campaign, the WWF used body painters to paint hands into endangered species. Beautifully implemented. A series of innovative shopping bags that are sure to grab peoples attention. 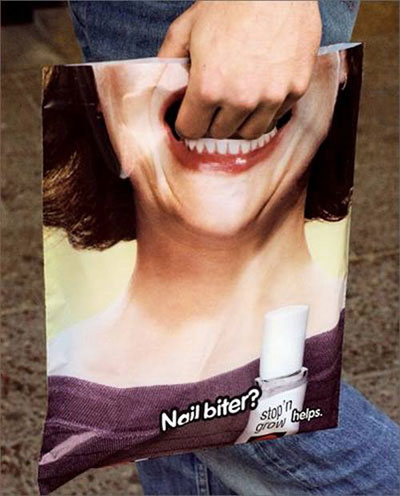 It’s frightening how realistic the ‘Nail Biter’ shopping bag is! An interactive billboard that people can’t argue is creatively implemented. 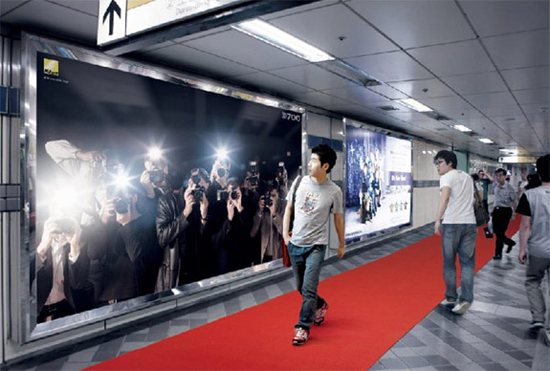 A red carpet was placed next to the advertisement that led all the way to the Nikon shop. As a person walked by, the cameras in the ad flash to give the impression that they are a celebrity being photographed by the paparazzi. In many countries worldwide, electrical wires are connected to buildings via street poles. 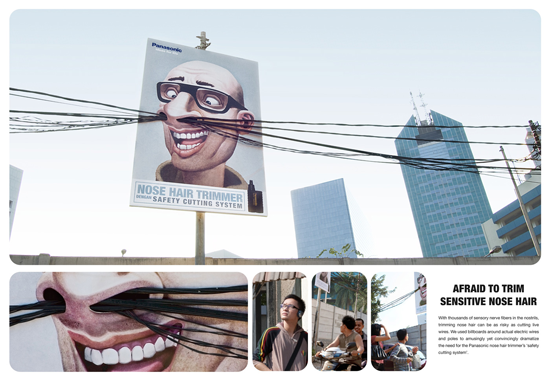 Panasonic made use of these wires by building their advertisement for nose hair trimmers around them to comic effects. 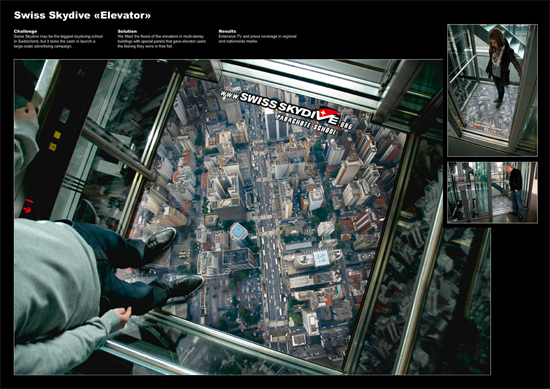 A cool ad that shows you don’t have to have a huge budget to be creative with your advertisements. 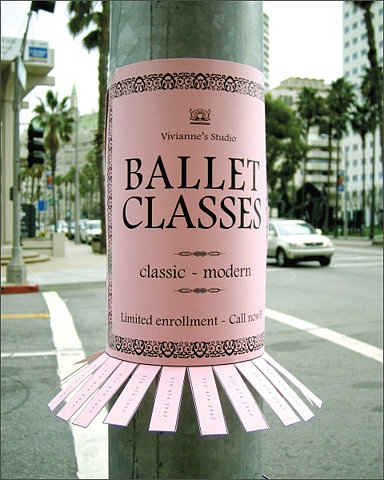 The ballet studio spread the contact information pull tabs out at the bottom of the ad to give the impression of a ballerina dress. An Apple campaign that showed off the random nature of the iPod shuffle. 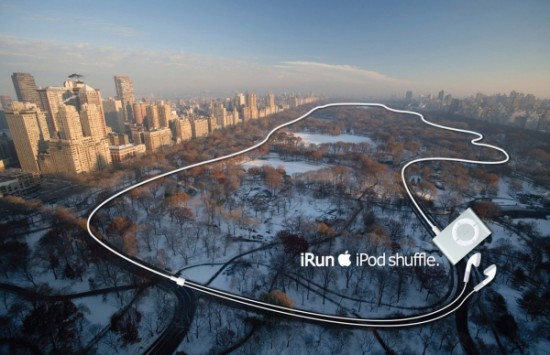 The series of ads placed the iPod earphones on popular destinations to give the impression of the route the runner had taken. 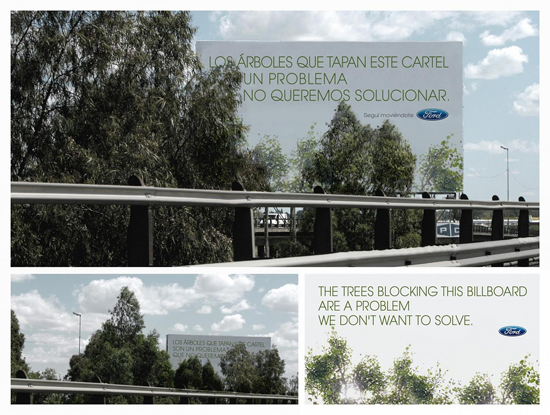 Ford promoted their dedication to eco-friendliness by stating that ‘The trees blocking this billboard are a problem we don’t want to solve’. A cool way of making the most of an advertisement area most companies wouldn’t want. 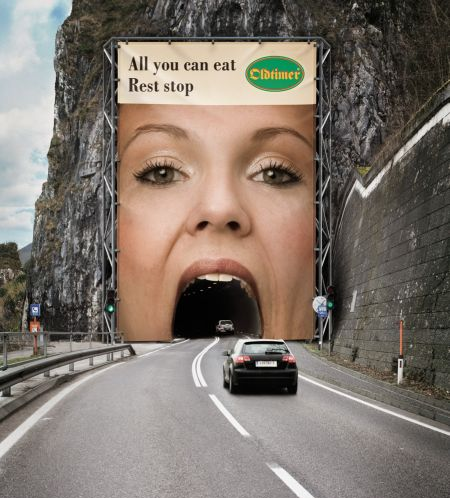 An Austrian chain of motorway restaurants surrounded tunnels with huge advertisements to promote their ‘all you can eat’ rest stops. I doubt there were any drivers who didn’t take notice of this massive in your face ad campaign. 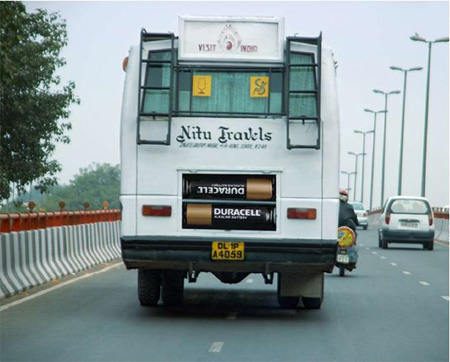 For a long time Duracell showed robots, rabbits and other objects being powered by their batteries and outlasting rivals who are using alternatives. This idea transferred well to buses and trucks and no doubt grabbed the attention of a lot of fellow motorists. 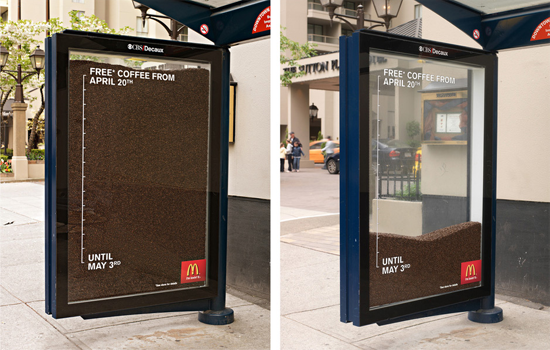 McDonald’s advertised their 2 week free coffee promotion by filling up a bus shelter window full of coffee beans. As the promotion progressed, an appropriate percentage of coffee beans were removed to reflect how much was left in the promotion. 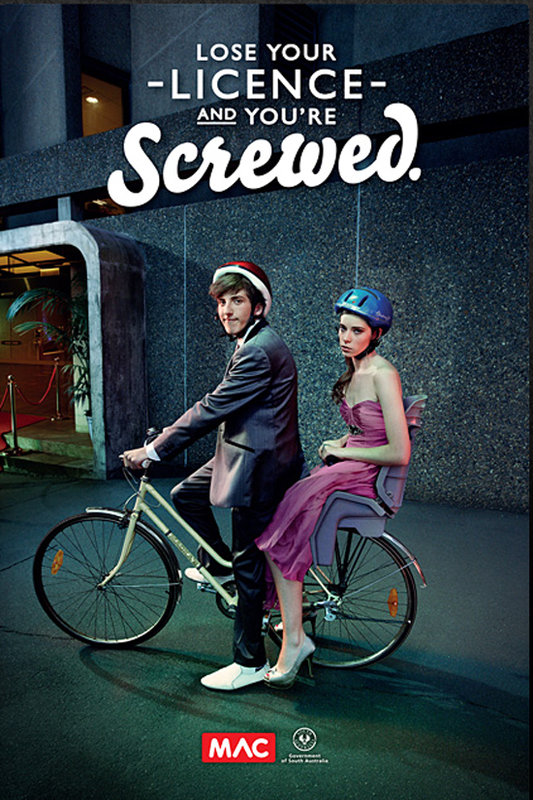 Using humor to tackle the subject of facing the consequences of losing your driver’s license, the ad reflects the embarrassment and frustration of taking your date to a high school dance on your bike. 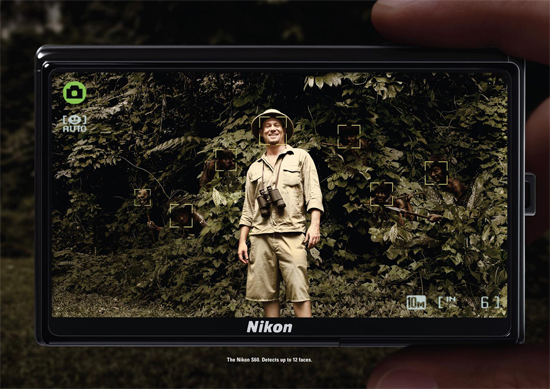 Nikon showed their new face detect feature, which detects up to 52 faces, with a happy go lucky traveller who is unknowingly about to be captured in the wild. 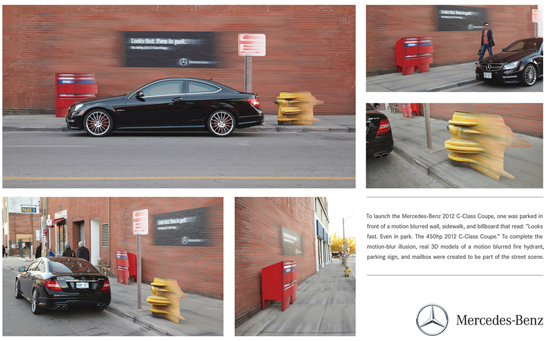 Using a motion blurred wall, sidewalk and billboard with 3D models of a fire hydrant, parking sign and mail box; Mercedes emphasised the speed of their 450hp 2012 C-Class Coupe with their ‘Looks fast. Even in park’ campaign. 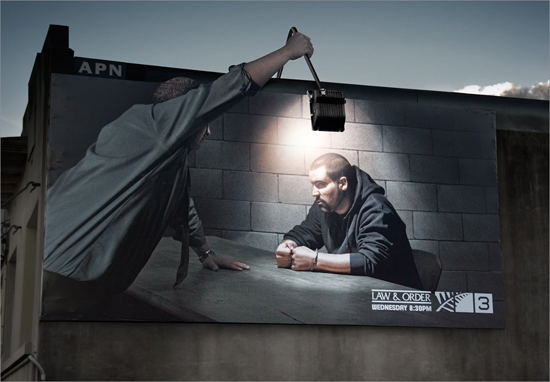 Integrated into the building behind, this advertisement for the TV show Law & Order brings the street light into the ad itself in an eye catching way. 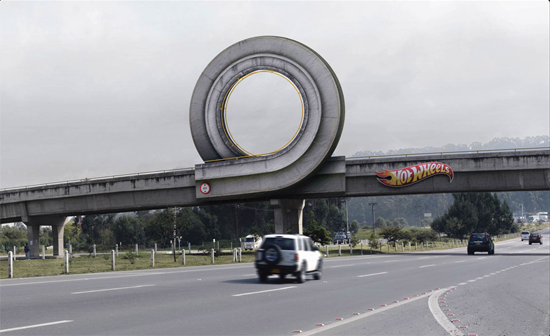 Used in Bogota Colombia, the famous toy car maker Hot Wheels added a ‘loop the loop’ to a bridge above a busy motorway. Another great example of integrating the environment with the advertisement. 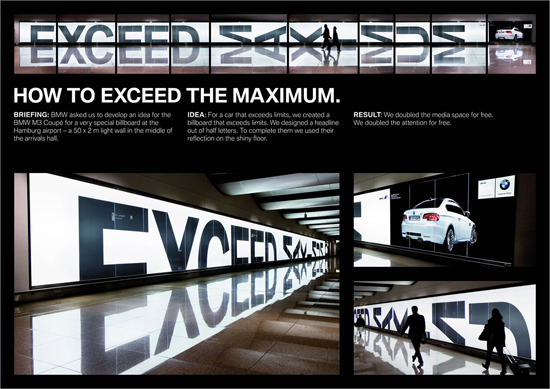 Using a 50 X 2 light wall in the middle of Hamburg airport, BMW used a headline out of half letters to promote their M3 car. The reflective floor completed the bottom half of the headline. Fitted to the bottom of elevators in multi-storey buildings to give the impression of free falling, this Swiss skydiving company gained a huge amount of media exposure with a limited budget due to the popularity of the advertisement. 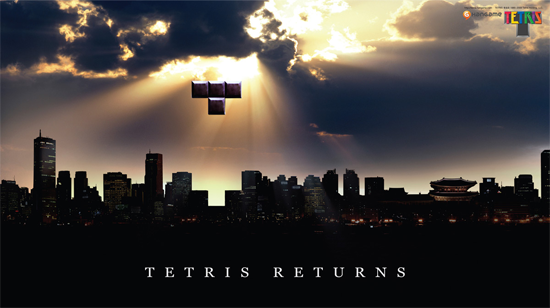 Falling from the heavens, a Tetris block prepares to fit into the city landscape. A creative advertisement that fans of the popular game will surely love. 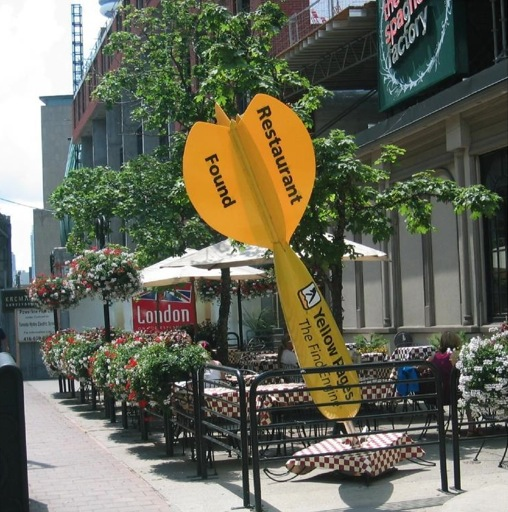 Winner of the Cannes Lion advertising award, the dart campaign for Yellow Pages Canada apparently gave their website an 18% increase over the previous year. Talk about hitting the mark. 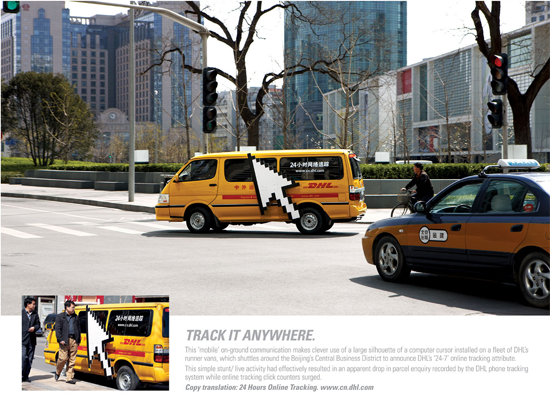 A digitised cursor was placed on DHL couriers and vans across Beijing to promote their online website. The ad was so successful that it led to a reduction in telephone inquiries and an increase in online tracking counters. A joint advertisement for the Sony Playstation Portable and Renault Scenic. 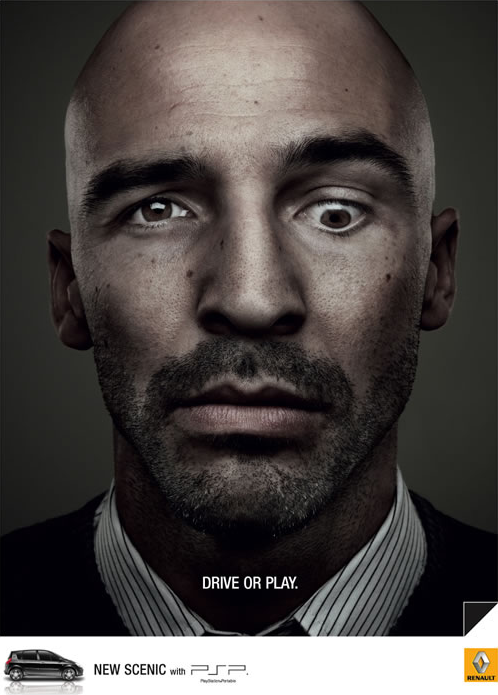 The ad cleverly shows one eye on the road and one eye on the Sony PSP. Drive or Play? This ad seems to comically suggest some can do both. 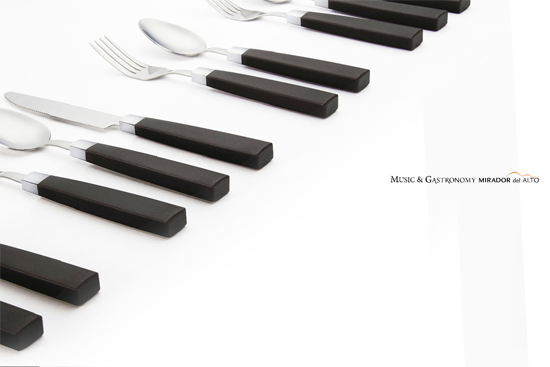 An elegant advertisement that promotes a piano restaurant by placing the cutlery to mimic the arrangement of black piano keys. 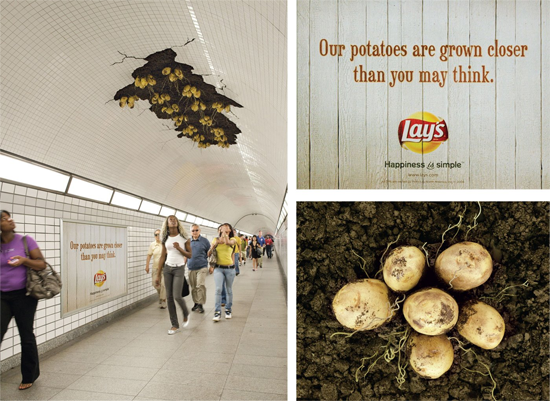 It would be hard not to notice this advertisement from Lays. All the train passengers who walked through this underground tunnel looked up to see potatoes growing from the roof. Folgers turned a common eyesore in New York into one of the most creative advertisements seen in years. 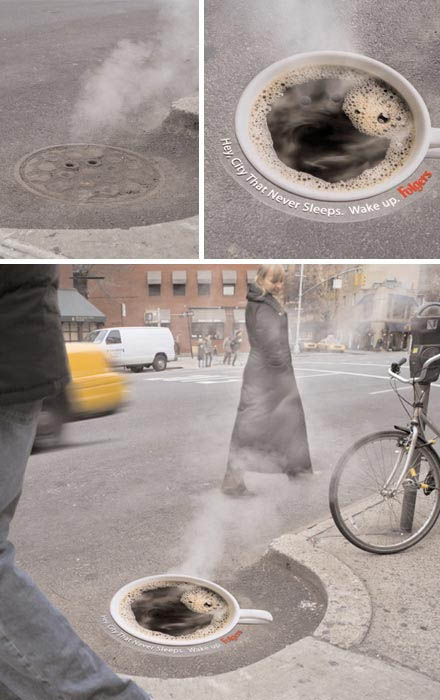 The drain cover was replaced by an image of a coffee cup, giving the impression that the rising steam was heat rising from the coffee. How do you advertise a product that everyone takes for granted? Easy. By showing you what you would have to do if you didn’t have it. We hope you’ve enjoyed this list of fun, creative and entertaining print and outside advertisements. Which one was your favourite? Or if you have a favourite that wasn’t featured in this post, use the comments to leave a link to it. Great compilation. But 5. Google Streetview is not in the uk. But in Amsterdam at the “leidseplein”. Very nice collection. Some of them brought a good smile. All of them were really creative, though Post-It was my personal fave with the Ballet Studio and the License ones coming in a close second. Some adverts that were new to me here so thanks for sharing. I love collecting quirky adverts from around the world and actually set up a Tumblr to collect them (Hint: It’s linked from my name in this comment). Ambient advertising is one of my favourite to witness when it hits the spot right! Nice roundup! Some I have seen before, many I have not. I love 28 the Lays add and especially 29 the Folgers ad. Very creative. nice, amazing, i have no words for it…….